The latest item to blow up social media and the news circuits is yet another bizarre controversy. The widespread national anthem protest by NFL players after the president’s comment this weekend has divided people even further, leaving many of us simply shaking our heads. The most noise here is coming from those who object to the protest. The opinion being strongly presented is that taking a knee is disrespectful. That is perhaps the most puzzling part. Kneeling has traditionally been a sign of reverence and supplication. Throughout history, children have kneeled before their parents, it is used at the holiest moments in prayer and is the position knights-to-be assume while pledging their loyalty to their ruler. People are howling that this action is degrading the flag. If these athletes were burning the flag, stepping or spitting on it, that would make sense, but kneeling before it? Others rage that it is disrespectful to veterans who fought for the rights we hold so dear. (After all, everyone loves veterans, at least until budget time when their need to have food, housing and affordable medical care comes into play.) This discounts the fact that those rights include the power to have and express our opinions as well as to peaceably protest (both protected under Amendment #1). Further, the images seen at many football games yesterday showed many players on bended knee, with bowed head and hand on heart. This is hardly an image of disrespect. Some have brought the flag code into this argument. The flag code is a U.S. statute that specifically has no provision for enforcement and no penalty for its violation. This is actually a good thing, as most people have violated it in some manner. (See provisions about clothing, accessories and disposable goods.) While I am particularly careful with how I treat the U.S. flag and will always stand for the national anthem, I know that it is only a symbol; our quasi-worship of this piece of fabric is seen peculiar by most other nations. While the U.S. has done great things and as citizens we have much to be proud of, our nation has also been responsible for some terrible actions. 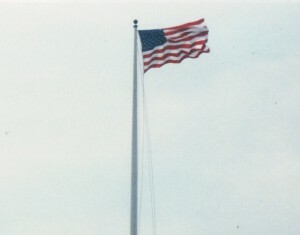 Like people, our nation is flawed and unlike God, it and its symbols should not be worshiped. As often happens, people are sharing stories on social media that serve to heighten the controversy, without verifying their accuracy. In this case, one references rules about the national anthem in the NFL Rule Book. Going straight to the source, the downloadable 2017 NFL Rulebook, you will find no mention of the national anthem at all. Another popular post details a number of battles our brave veterans have served in, challenging athletes to do the same. Unfortunately, it starts with Valley Forge, a national park that has great military significance, (and where many brave souls died) but no battle was fought there. Many are outraged that politics has been brought into their weekend entertainment; crying “Keep politics out!” and vowing to abandon the league. However, when politics affects one’s daily life, it becomes personal and cannot be separated. The current social and political climate is a challenging one. No one has been left untouched. Families and friendships have been torn apart. It has become impossible to stay truly neutral. Sports figures have long been idolized and fans can be rather possessive. Yet, athletes are people, with their own values, beliefs and special interests. Few fans truly know their sports idols. They don’t know their family background and what life experiences they have had off the field. They don’t know what injustices they or their families and friends may experience on a regular basis. They can’t know what drives them and what worries keep them up at night. Sports heroes are put in a position where they might be able to make a difference and taking advantage of their platform is the right thing to do. While there has been doubt as to what taking a different stance during the two minutes of each game that attention is drawn to the nation’s flag (personally, I didn’t see the point and didn’t think it accomplished much), this weekend has shown that it can make a great difference indeed.